Our site in Houston/Texas, USA. 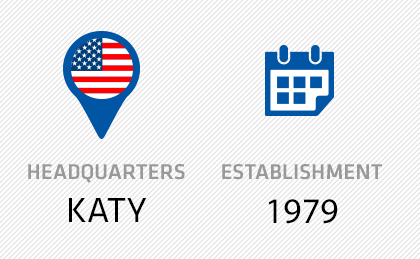 Ever since its establishment in 1979, Heyltex Corporation, headquartered in Houston, Texas, has been the basis for the commercial success of our company in the North-American market. It all started with the production of collagen and in the eighties Heyltex became Estée Lauder®’s exclusive supplier of collagen. In the nineties, Heyltex sold Dimaval® (DMPS) all over the United States; starting in 2002, the business relationship between Heyl and Heyltex grew closer as we were applying for FDA-approval for our antidote-product Radiogardase® (Prussian blue insoluble capsules). Since 2004, Heyltex has been the lone distributor of Radiogardase® in the United States. Heyltex has expanded its portfolio with specialized consulting services and the licensing of products from other manufacturers. The experience in sales and distribution of antidotes, especially in the areas of homeland security and orphan-drugs, makes Heyltex a competent partner for national and international licensing. Our team in the United States has close relationships with the key contacts in the USA – from the Food and Drug Administration, to ministries and research institutions, to experts in poison control centers and partners for a successful marketing of their products. Heyltex advises both small and medium-sized businesses that do not have their own presence in the US, as well as American enterprises that want to use the extensive network and the existing resources of Heyltex. Anyone could become a victim to a poisoning, be it intentional or unintentinal. With their range of antidotes, the company HEYL offers many medically important counteragents to poisonings with heavy metals and radionuclides. Rheumatoid arthritis is the most common inflammatory joint disease, with 0.5 to 1% of the world's population suffering from it. The company HEYL has been offering rheumatic therapeutics since its establishment, facilitating the lives of those affected. Vitamins are essential for many vital functions of the human body. Our organism often cannot, or only insufficently, synthesize these organic bonds by itself. That is why vitamins need to be taken up with our diet. Although this infectious disease, caused by microscopically small parasites, is mostly asymptomatic, it must be treated with an antibiotic during pregnancy or in the case of immunocompromised patients to prevent serious consequences. Humans that are affected by this hereditary metabolic disorder can no longer secrete ingested copper. In untreated cases this results in severe damage to the brain and liver. An antidote developed specifically against copper may be the best method here.